three miles off the Northumberland Coast between Seahouses and Bamburgh. As well as being the most famous Sea Bird Sanctuary in the British Isles they also have a large colony of Atlantic or Grey Seals. 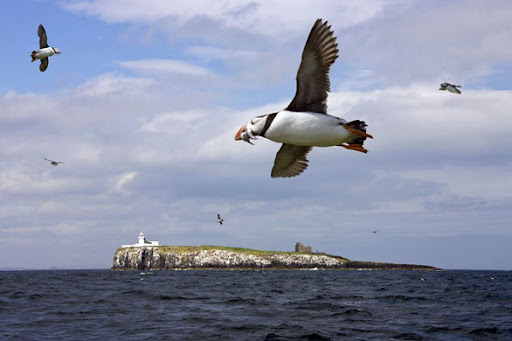 Birds that use these islands for nesting include Puffins and several breeds of Terns. There are some 100,000 pairs of breeding birds in the height of the season and they are remarkably tolerant to visitors, almost ignoring their presence for the most part. This allows you to get close up to these wonderful creatures and the photo opportunities are endless. There are glorious beaches to the North and to the South of the Town, with most popular being to the North of the harbour. This wide sandy beach, backed by golden sand dunes has the glorious back drop of Bamburgh Castle. It is perfect for a family day out at the beach with the amenities of Seahouses close by. The Good Beach Guide rates this beach as recommended for the highest UK standard of water quality for bathing. This stretch of beach is very popular with people staying in Seahouses and it's easy to see why. It's just a short walk from the Town over the sand dunes. The beach is popular with windsurfers, kite surfers and surfers when there is a good swell. The Northumberland Coast is designated as an Area of Outstanding Natural Beauty and as such offers some of the best coastal walking in the country. The Northumberland Coast Path runs from Beadnell in the South, through Seahouses and on towards the magnificent Bamburgh Castle in the North. Seahouses makes an excellent base for walkers, see our Walking page for more information about the Northumberland Coast Path and other walking routes in the County. The Great North Bike Ride sets off from Seahouses each year and continues all the way along the stunning Northumberland coastline all the way through this Area of Outstanding Natural beauty and finish at Tynemouth Priory and Castle. The ride takes place on the August Bank Holiday weekend, see their website for more information about how to get involved. Cycles can be hired and delivered to where ever you are staying by the local company Boards and Bikes. There are stables (Slate Hall Riding Centre) in Seahouses where you can arrange for horse riding lessons, treks and even beach rides. Such a romantic vision, galloping on horseback on a stunning beach with Bamburgh Castle as your back drop. The beach rides are reserved for experienced riders only, but novices can have lessons in their all weather arena and a walk or trot on quiet country roads. Lessons are available as are various rides up to half a day in length. Visit their website for more information and pricing. Northumberland has an excellent selection of Golf Courses and Seahouses is not the exception. Founded in 1913 Seahouses Golf Course was then a 9 hole course, but was increased to an 18 hole course in 1976. It is the home of two of the most prestigious par three holes in the North of England. Visit their website for more information and green fees. There is also a crazy golf course in Seahouses on the seafront that has lovely views and has a soft play space for children and a restaurant. Visit their website for more information. There are many other golf courses nearby to Seahouses. Just to the North there is Bamburgh Golf Club, and to the South there is Dunstanburgh Golf Club and two Courses at Alnmouth. Be sure to visit our Golf page for full information about the County's Courses. The beach to the North of Seahouses, also known as St Aidan's Beach, is popular place for watersports. Not only does it offer the wonderful views of Bamburgh Castle and the Farne Islands, but it is also provides some good waves for surfing near to the harbour and has good conditions on the main beach on a South swell. Other places nearby that are known to be excellent surf spots include Bamburgh beach just to the North of Seahouses and Beadnell Bay, just to the South. Northside Surf School offer beach surf lessons on several beaches along the Northumberland Coast including Seahouses. Courses start at 2 hours and go up to 5 days and are run by Jon Nolan, a British Surfing Association Coach and an RLSS Beach Lifeguard so you know you're in safe hands. They operate 7 days a week and 12 months of the year and cater for all needs. If you need any equipment to have a go at any of these sports then the company to get in touch with is Boards and Bikes. They supply and hire wetsuits, boards and bikes to the Beadnell, Seahouses and Bamburgh area. They will even deliver them to wherever you are staying, be that a B&B, Hotel or caravan. They don't just hire equipment, they also run excellent value lessons on the beaches of Bamburgh, Seahouses and Beadnell. They start from 2 hours and include a full safety brief before allowing you in the water as safely as possible with their skilled and friendly teachers. Diving is also popular from Seahouses, with the many wrecks from the treacherous rocks of the Farne Islands being the main draw. The water is exceptionally clear here and there is usually numerous inquisitive marine wildlife that will come along and say hello! This includes the Atlantic Grey Seal that live and breed on the Farne Islands, they like to check out what you're up to. There are many wrecks around the Farnes including the Somali, a 450 foot Steamer that was sunk in 1941. There are also many interesting sites in shallower water that make an excellent dive, visit the North East Diving Site for more information and site descriptions. You can take your own boat out for diving from Beadnell, Seahouses or the larger port of Amble or you can hire one of the local operators. The most popular is Billy Shiel's Company Glad Tidings. They have two boats with specialist diving equipment with dive lifts fitted for easy access to the water. Contact them via their website for more information. Seahouses is also home to many an angler and there are a number of sea fishing trips on offer from the harbour. Alan Dawson and his family have over 40 years experience fishing the North Sea and run fishing trips in their MFV 'Guide Me'. He is fully qualified to carry up to twelve passengers on his boat and offers trips from 3 hours to 6 hours and is also available for private charter. You will be fishing the seabed for species such as Cod, Ling, Pollock and Mackerel. For more information visit their website. Unity Fishing Trips can also cater for all your fishing trip needs from 3 hours for novices and families up to 8 hour wreck fishing trips at some of Northumberland's most famous wrecks. Contact skipper Matty Stephenson via his website for more information.